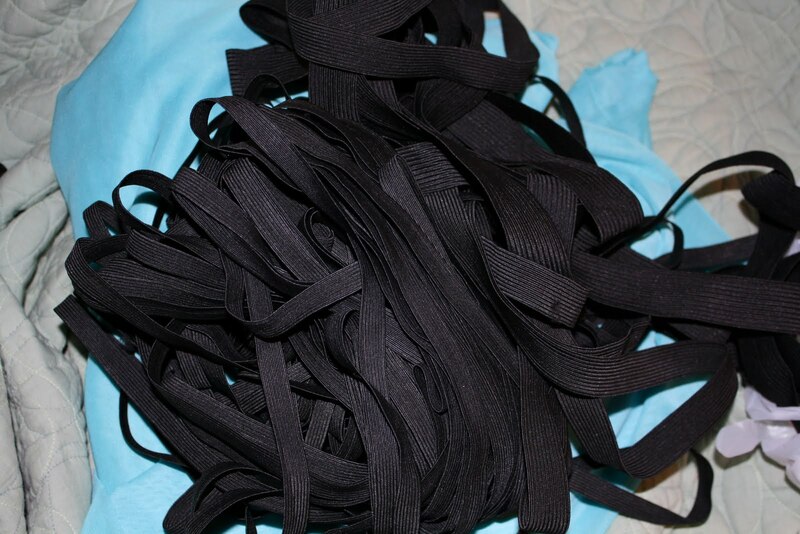 A whole mess of elastic! Fabric! 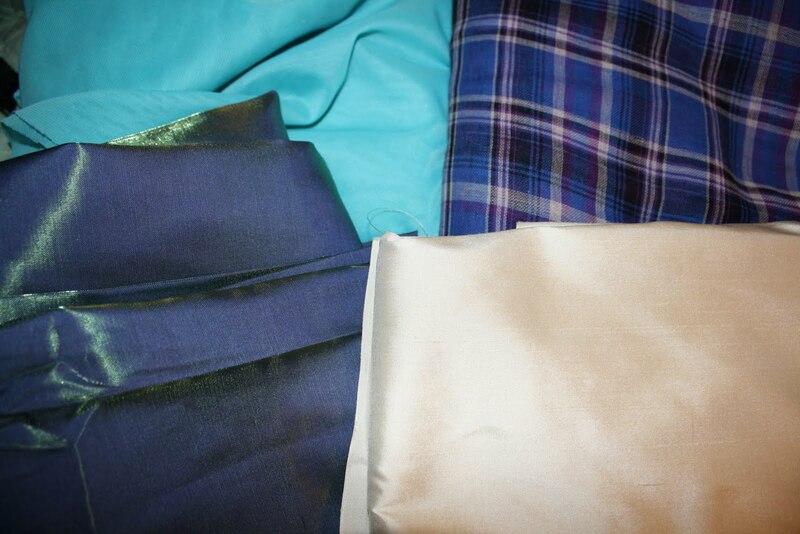 Minty stretch mesh, lightweight cotton plaid, purple/green shiny polyester, cream silk. The elastic I will be needing in the coming year for more skating costumes. I want to make a few more practice dresses after I finish up summer sewing for my sister, and those things use elastic like crazy (especially 3/8″ I am forever running out…), so I just got a ton while it was half off. I got some Vogues that I wasn’t able to find in my size at the last sale, so that was good. I still have a few Vogue on the wish list, but since these are still $4 on sale they add up a bit faster and I spread them out. 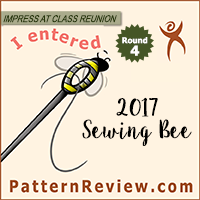 I have really liked the results from the Vogue patterns I have used so far, so I think it is worth getting them, even at the higher price. As for the fabric, the most expensive was my $6/yard cream colored silk dupioni, which I still consider to be a pretty good price for real silk. The plaid cotton will be used for a shirt eventually, and the stretch mesh is for skating costumes. As for the green/purple shiny poly fabric (which looks more green in real life, but more purple on film)… I want to make a pretty party dress, but I am undecided on pattern and style. It was only $3/yard, and I really liked it so I got 6 yards. 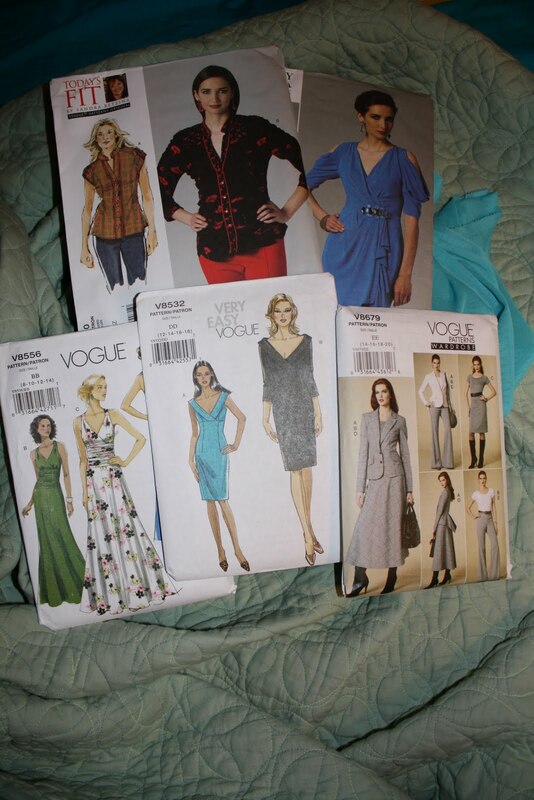 I could either do a long streamlined gown and have enough left for a short cocktail-length dress, or I could use one of the retro patterns that will use all 6 yards in order to get a full poofy skirt. Decisions, decisions. I wanted to make sure I had enough in either case though. And I want something with pleating or gathers that will show off the color change of the material. I suppose I could use it for a costume, but I sort of think it looks a little too modern and shiny for a fantasy costume, and I really think it would work better as a more modern style dress in any case. And, as I expected, no new McCall’s for $0.99. Oh well. 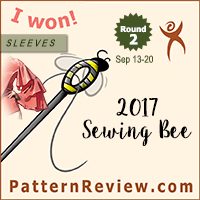 There will always be another pattern sale. Also, hopefully, some finished object posts coming later this week! I have finished a skirt and nearly done with the European travel cape (have to hem half of the cape bottom), so that will get done today. The winter coat is in progress, and needs to get done within the next few weeks. I am looking forward to being finished with that as well.